The Recognition of Place: Strength & Endurance of Aboriginal Women is a new exhibit that focuses on the significant place women have in First Nation and Métis cultures. It speaks to the important contributions women have made to individuals and their impact locally, nationally and internationally. The exhibit addresses the issue of missing and murdered women by honouring and exploring the lives of Daleen Bosse and Amber Dawn Redman. 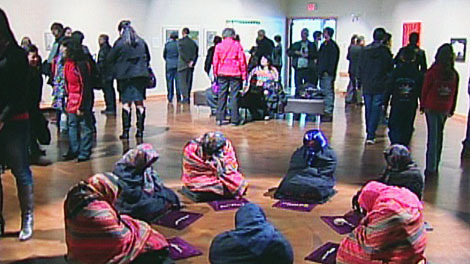 The exhibit was produced by Sasipenita, a Saskatoon-based non-profit organization that creates programs to counter negative stereotypes and to positively influence how First Nations and Métis peoples are viewed. “Sasipenita”, which is a Cree word meaning “never give up”, is the result of a project created by Monica Goulet as part of her Master of Business Administration. This entry was posted in Cree History and tagged Bette Spence, Freda Ahenakew. Bookmark the permalink.